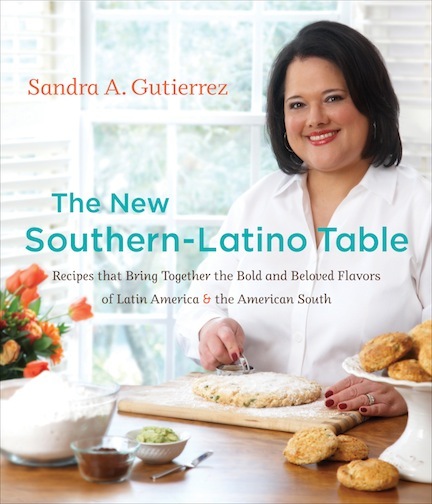 From brownies to barbecue, Sandra Gutierrez’s innovative recipes showcase the flavor of the New South. On my first trip shopping for groceries in a bodega in Guatemala, a familiar item grabbed my attention from the snack section. The bag read chicharrón, but the bubbled tan craters of fried pigskins peeking through the cellophane said “pork rinds,” loud and clear. Sandra Gutierrez, a long time food writer, grinds up the crackly rinds and incorporates them into flour for buttermilk biscuits in her new book, “The New Southern Latino Table: Recipes that bring together the bold and beloved flavors of Latin America and the American South.” This innovation imparts a deep, rich pork flavor to the Southern staple. Combining chicharrones and buttermilk biscuits is just one of the genius combinations Gutierrez creates in a cookbook that celebrates the best of two cultures that have been edging ever closer together over the last decade. Gutierrez, a former food columnist for the Cary News in Cary, N.C., finds three major commonalities between the traditional cuisine of the South and that of Latin America. The roots of both cuisines come from indigenous people of the Americas, European settlers and Africans from the transatlantic triangular trade who found themselves and their food thrust together in a New World. Second, “we have a similar basket of ingredients that we share,” said Gutierrez, “among them corn and beans and nuts and pork and tomatoes.” Finally, braising, deep frying and barbecuing are inextricable to the two cultures. This amalgamation came first to Gutierrez’s own table when she moved to Durham, N.C. as a young newlywed in the 1980s. Gutierrez grew up a student of her beloved Aunt Maria, who ran a successful catering company. Maria taught her the basic French techniques of gourmet cooking as well as the all of the classic Latin dishes. As Gutierrez started a family in the Tar Heel state, she found fresh cilantro and dried cornhusks hard to come by. But she learned traditional Southern cooking from friends and neighbors. “Today, my children are likely to ask for barbecue pulled pork with a side of guacamole,” Gutierrez writes in the introduction to her book. Several recipes are becoming instant classics since the book was released about two months ago. One such recipe combines the fire of spicy chiles with the chewy indulgence of chocolate brownies. “The combination of chile and chocolate has been happening now since ancient Mayan and Aztec times,” said Gutierrez. “Traditionally used for bitter drinks, they believed it was the food of the gods.” The pairing of the two flavors with the sweetness of a dessert is inspired, and has drawn a great deal of attention from readers. Another popular recipe is a reinvention of the causa, a Peruvian potato salad. Gutierrez reimagines the causa by deconstructing the traditional Southern potato salad, with its olives, eggs and pimentos. The writing in the book is warm and informal; in fact, the introduction’s tribute to the diverse cultures that built our nation moved me to tears. It’s also worth noting that health conscious and vegetarian readers will find as many recipes to suit their diets as will meat-lovers and those looking for a more indulgent meal. I love cracklin’s and have never thought to grind them up for biscuits. Sounds delectable! I’m going to definitely check out this book. Love hearing about not just the food, but this very intereting chef!